Building desktop applications can be an enjoyable experience if you’re willing to throw in a bit of Groovy into the mix. Griffon is an application framework that follows the spirit of Grails to bring back the fun to desktop development. Desktop application development, a term that isn’t heard much these days as web development nor concurrency and parallelism are. However that doesn’t mean it’s dead as some proclaim. There are indeed some industry sectors where a desktop application is the top alternative for solving a particular problem; in some other environments it’s the only choice for security reasons. Think of financial institutes, banks, the health industry, biological research, chemical laboratories, satellite operations and the military; just to name a few. All of them impose a particular set of restrictions where desktop applications excel over web applications, such as security, access to local resources, devices and port communications. The other thing that they have in common is Griffon. Yes, the Griffon framework has helped teams in all those industries and spaces to get the job done. You may have heard of Griffon before but still wonder what it is. In short, it’s a desktop application platform for the JVM. It has strong roots in the Groovy community as the project is the brain child of the Groovy Swing team: Danno Ferrin, James Williams and myself. That being said, you may excuse me if I get a bit excited explaining some of Griffon’s features, as I’m very fond of the project. 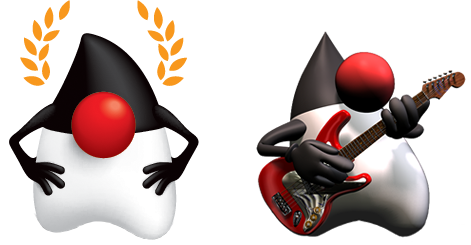 A key driving force behind the framework’s design is that it should be easy to pick up by Java developers. It should also enable quick coding cycles while keeping the source nice and tidy. Finally, the productivity gains and the fun factor must be immediately perceived. For these reasons the team decided to follow in the steps of the Grails framework and its community. There are a lot of similarities between both frameworks. For instance, both have a command line interface that helps you get around with the usual tasks of creating, building, packaging and deploying applications. Both frameworks leverage the Groovy language as a glue for their respective software stacks. The tool integration is also quite good, as major IDEs and popular text editors offer good support for dealing with this kind of projects. But enough of the theory, let’s get some practice! 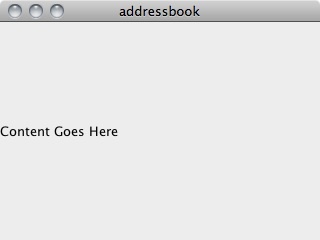 The rest of this article will be devoted to building a simple address book application. We will definitely not build a full-fledged application in the few pages that we have to spare but it’s my hope that all the things to be discussed will give you enough pointers to get you going with the framework. You’ll notice a flurry of lines in the output. Go ahead and inspect the contents of the newly created application if you want. The create-app command initializes the application by creating several directories and some files. One of these directories is of particular importance, its name is griffon-app. Within this directory you’ll find another set of directories that help keeping the source code organized. Figure 1 shows the expanded content of the griffon-app directory as created moments ago. This should compile the application sources, package resources, roundup dependencies and launch the application. In a matter of seconds you should see a window popping up, like the one shown in Figure 2. Granted, it doesn’t loom like much, but we haven’t written a single line of code yet! Listing 1 shows what you’ll find inside the file griffon-app/views/addressbook/AddressbookView.groovy when you open it. What we see here is a Swing-based Domain Specific Language (or DSL for short) based on a popular Groovy feature: builders. In our particular case we’re dealing with SwingBuilder. Builders are but a collection of nodes and rules that know how to build hierarchical structures. It so happens that a Swing UI is comprised of a tree of components. In the View we can observe a top level node named “application” and some properties being applied to it. Next we see a child node named “label” with a single text entry. You may recognize the code structure with what’s shown by Figure 2. That’s the power of the Swing DSL. The code and the UI resemble each other a lot, it’s quite easy to follow how components are structured when reading the DSL. Now that we have seen a bit of code in the Views, let’s continue with this MVC member, we’ll cover the other two in a moment. In the spirit of keeping things simple we’ll update the UI so that it looks like Figure 3. Let’s decompose each section. On the left we see a white space with a title ‘Contacts’. This will be a list that holds all the contacts in our address book. In the middle we see a form that we may use to edit the details of a particular contact found in the list. Next on the right we discover a series of buttons that will perform operations on a contact. You may also appreciate a menu named ‘Contacts’ which contains menu items with the same names as the buttons. Listing 2 describes the updated AddressbookView. We can see the menuBar node we mentioned earlier. We can also see three main components: a list that will be placed on the west side; a panel in the middle that somehow creates a pair or label and textField for each property found in a list of properties. Then we see the third component, a panel that holds buttons. The code may look a bit magical at first glance but really what we’re doing is taking advantage of the conventions laid out by Griffon. A View MVC member has access to the other two members, that is, the Model and the Controller. The job of the View is to lay out the UI components. The job of the Controller is to hold the logic that reacts to user input. The job of the Model is to serve as a communication bridge between View and Controller. We can see references to a model and a controller variables in the View; these variables point to their respective MVC members. Next we’ll update the Model found in griffon-app/models/addressbook/AddressbookModel.groovy. Here we’ll make sure the Model keeps a list of contacts in memory; it will also hold a reference to the contact currently being edited. We’ll make use of GlazedLists (a popular choice among Swing developers) to organize the list of contacts. Listing 3 shows all the code that’s required to build the list and keep a reference to the currently edited contact. Now, the contacts list has a special binding defined in relation to its elements. Whenever an element is edited it will publish a change event that the list will intercept; the list in turn will update whoever is interested in lists changes. Looking back to Listing 2 you can see that the list definition makes use of a listEventModel node. This is exactly the component that will notify the UI whenever an update is available, this repainting the affected region. And we only had to connect a pair of components for this to happen! The AddressbookModel works with two domain specific classes: Contact and ContactPresentationModel. The first can be seen as a plain domain class, as it defines what a contact should be in terms of simple properties. The latter is an observable wrapper around the Contact class. Presentation models are usually decorators that can support binding operations. We’ll see these two classes in just a moment. Do you remember that Models mediate data between Controllers and Views? That’s precisely why there’s a model property on the controller class. Griffon sports a basic dependency injection mechanism that will assure each MVC member can talk to the other two as long as certain properties are defined in their respective classes. If you’re a Grails developer you may have noticed we did not start by modelling the domain, which is the usual case when working with Grails applications. There are two reasons for making this choice. First, to show you the basics of the MVC members and how they interact with each other. The second is that Griffon does not support domain classes out of the box, at least not as Grails understands it, that is, there’s no GORM API for Griffon, yet. But we can manage ourselves by writing simple domain classes. Listing 5 for example shows what the Contact domain class may look like. This class can be defined in the file src/main/addressbook/Contact.groovy. Next to it we’ll define the companion presentation model, in src/main/addressbook/ContactPresentationModel.groovy with the code seen in Listing 6 in it. As we mentioned before, the domain class is simple in its design; it only needs to be concerned with the data we want to keep. The presentation model on the other hand mirrors the domain class by having the same properties but with a slight modification: each one of them is observable. This means that whenever the value of any of those properties changes, an event will be fired. These events are the ones that enable binding. Griffon makes use of the @Bindable annotation to instruct the Groovy compiler to inject a set of instructions into the byte code that makes this class an observable one. @Bindable belongs to a set of special interfaces found in the Groovy language that open the door for byte code manipulation. This set is known as AST transformations. There’s another AST transformation found in this code, it’s @PropertyListener. This transformation is a fancy way to define and attach a PropertyChangeListener on a particular class and property. In our case, we’re attaching a PropertyChangeListener that reacts on all property changes. The next effect of all the code we have in Listing 6 is that when a Contact instance is attached to an instance of ContactPresentationModels, all of the property values will be copied from the contact to the model. The reverse operation will take effect when the updateContact() method is called. After a few lines of output for each plug-in install we have all that’s needed to run the application again. The first action, newAction, is concerned by resetting the current selection (if any) and creating an empty Contact. The saveAction() should push the changes from the presentation model back to the domain object, store the data in the database and in the case that this is a new contact, add it to the list of contacts. Notice that when dealing with database concerns we’ll delegate to another component called storageService which we’ll see right after we finish describing the Controller. The third action deletes a contact first by removing it from the database, then removing it from the contacts list. We added a fourth action that will be used to dump the database contents into the console. The last piece of information found in the code relates to loading the data from the database and filling up the contacts list. The method name is special as it’s a hook into the MVC lifecycle. This particular method will be called after all MVC members have been instantiated, think of it as a member initializer. We’re ready to have a look at the storageService component. 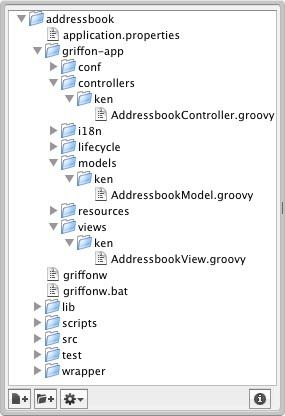 This will create a file in griffon-app/services/addressbook/StorageService.groovy with default content. Listing 8 shows the code that must be put inside that file for the application to work. Perfect. We now have enabled Groovy SQL support in our little application. Groovy SQL is another DSL on top of regular SQL. With it, you can make SQL calls using a programmatic API that closely resembles working with objects and object graphs. As a matter of fact, you can even apply Groovy closures, Groovy strings, and other Groovy tricks, like those shown in the implementation of the StorageService class. There are two more items we must take care of before launching the application again. We must tell the GSQL plug-in that the withSql method must be applied to services; secondly, we must define the database schema. As we said earlier there’s no GORM API yet, database schemas must be defined by hand. Good, we’re done. What about seeding the database with some initial data? In Grails this is done by editing a file named BootStrap.groovy, in Griffon it’s done by editing griffon-app/conf/BootstrapGsql.groovy. Let’s add an entry to the contacts table, as Listing 9 shows. Phew. Now we’re really done. Launch the application once more. You should see one entry in the contacts list as Figure 4 shows. Select it with the mouse and either press enter or double-click on it. This will make the contact the active one and place all of its values in the middle form. Edit some of its properties, then click on the save button. Create a new contact and save it too. Now click on the dump button. You should see as many rows in the output as entries can be found in the contacts list. Nice. The full source code for this application can be found at GitHub. There are more things that we could add to this application. For example, there’s no error handling whatsoever. What if SQL is not your cup of tea? No problem, you can pick any of the supported NoSQL options. Or maybe Swing is not for you. No problem either, Griffon supports SWT and JavaFX as well. Changing UI toolkits will mean changing the View mostly while keeping the other components almost intact. There are definitely many choices ahead of you.